I know you guys have heard us talking about this giveaway for a long time ! And if you haven’t heard about the 100,000 dollar free wedding giveaway you can go here for the story . East Ivy Mansion Giveaway East Ivy Mansion is this amazing old Nashville mansion and villa in East Nashville that became an event space as of late and it’s owner and friend of ours Ed Clay came up with an idea to have a giveaway ! The process was overwhelming . We received over 7000 submissions that got weeded down to over 600 that then we culled down to 35. One of the submissions (and our eventual winner) was a little 9 year old girl by the name of Riley that submitted her two favorite people in the whole world , her father Josh and his fiancé Corene! The letter was probably one of the sweetest things I’ve ever read. She submitted the letter because as she said “they take care of our needs (the children) before they ever take care of their own” This submission made us melt and was such a clear indication of who our true winner was, that we could not get past this amazing little girl or her two heroes. Now normally I would then talk about how long we had to wait for the day to arrive with using words like “finally” or “eventually”. Not in this case. It came and it came quick ! Within 3-4 weeks once we picked our winner our day arrived with a vengeance ! Somehow we were able to align the stars and make this whole thing happen. Well it wasn’t somehow …I know exactly how it happened – it was that Angela Proffitt and her band of magicians along with all of our gracious vendors who came together for this amazing once in a lifetime event! The weather was perfect…the mansion was impeccable and everyone seemed to be overjoyed about this gift of a wedding to the point that there wasn’t a bad word mentioned or face without a smile at any point during the day ! I’ve been to a lot of these and we all know how impossible that is to achieve ! It was so much fun ! And it came off without a hitch . 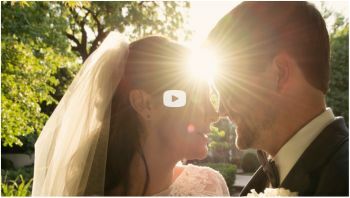 So sit back and look at the pictures that we did and the amazing videography done by our own Dylan White of The Life Lens Wedding Photography. It was truly a Dream Wedding Giveaway ! The pool at East Ivy Mansion is for decorative purposes only and its use is strictly prohibited during all events. Any violation will result in the immediate cancellation of the event.